Loungerati's choice destination for your krewe's Mardi Gras fun is The Salon's swank event at the DL Lounge.
" The Big Easy comes to the Big Apple on Fat Tuesday, courtesy of THE SALON! Our creole carnival features a spectacular lineup of more than 25 performers (incl. 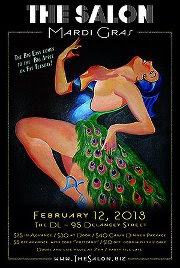 3 bands & 3 DJs), for your lounging 'n dancing pleasure...plus we've got Mardi Gras beads for every dame & dapper gent. For those craving more Nawlins, bring an appetite 'cause we've got the crawfish cookin! THE DL's fab chef is preparing a special Cajun 3 course Prix-fixe menu at the restaurant on the first floor... we'll keep your toes tappin to live music during dinner, then head upstairs for two more floors of live music, dancing, lounging and imbibing from some of the top talent in town." with GORDON AU and vocalist TAMAR KORN. New Orleans jazz & 30's era swing - developed by hobos, perfected by science! Featuring EMILY ASHER and BRIA SKONBERG. General Admission tickets include dance lesson, Mardi Gras beads and access to all floors.